Quickly improve and test your English Plurals skill. An exciting and new challenging English Plurals Quiz Game. English Grammar Quizzes are proven to be the fastest and most effective way to improve your English. Compete against your friends and teachers to see who has the best skill and knowledge to answer the most questions correct first time. Enter your scores on the Game Centre Scoreboard to boast to your friends who is the "King of Plurals". The challenge is to get all the spelling questions correct first time without making mistakes. 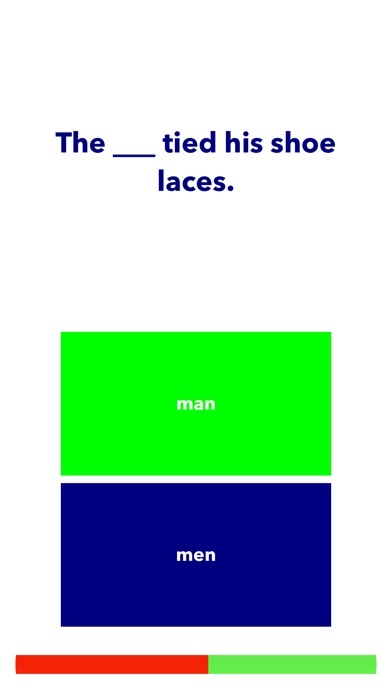 This English Plurals Quiz contains the most common plurals in the English Language. Download now and start feeling more and more amazing as your English improves so fast and quickly just as you had imagined.